This article covers credit checks run through Equifax directly. These directions will not be relevant if you are using a third party company to pull credit (ex. Credco, CBC, etc.). In DeskManager click File -> Setup, then in the list on the left, scroll down to Communications and click the + next to it to expand it, then click Equifax. Enter the Site ID, Password, System-To-System Customer Code, Equifax Customer (Member) Number and Security Code. You will need to subscribe to Equifax to include any features, options and/or models from the list provided. After you subscribe to any of the provided options, select the checkbox for “Subscribed“. 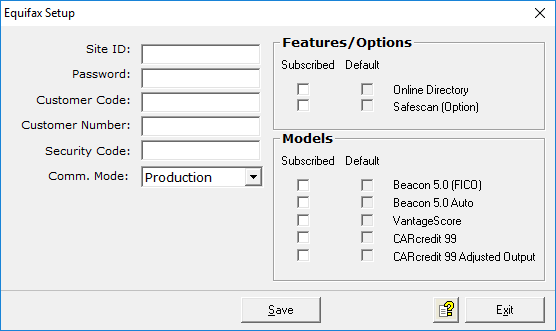 The “Default” checkboxes can also be selected if you require a typical user to run credit with these default options (a subset of the Subscribed). Online Directory – Contains telephone numbers and upon request addresses of all collection inquiries and trade segment companies shown on the report. Safescan – An interactive, on-line warning system containing information that has been or could be used to perpetrate application fraud. *Note – This option can only be turned on/off by Equifax. Beacon 5.0 – Developed by Equifax and Fair Isaac, this is a risk assessment model that forecasts the future risk of a consumer’s accounts going severely delinquent within 24 months. It analyzes the information contained within the credit report and assigns a score based upon risk level. Equifax calls their Fico credit score a Beacon score. Beacon 5.0 Auto – It is a Beacon scoring model specially developed for the Auto Industry. VantageScore – The first tri-bureau consumer credit risk model of its kind and is defining a new standard in consumer credit risk scoring. It estimates the likelihood of a consumer becoming 90+ days past due including internal collections, charge off, repossession, foreclosure and bankruptcy) within 24 months of scoring, then returns a three-digit score. CARcredit 99 – The Equifax’s second generation risk prediction tool for the Automobile financing and leasing industries. It predicts the probability of delinquency (60+ days past due) within a 24 month period. CARcredit 99 Adjusted Output – An additional output option is being offered with Equifax Risk Score CARcredit 99. It predicts the probability of delinquency (60+ days past due) within a 24-month period. For detailed information about the above features and models, ask the Equifax Representative.